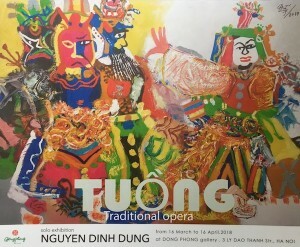 New Exhibition "Tuồng " by artist Nguyễn Đình Dũng will be held from 16 March to 16 April at Dong Phong Art Gallery, #3lydaothanhstreet. Welcome art lovers to visit the Show. Nguyễn Đình Dũng (born in 1943) is self-taught artist, and has been successful with silk and oil paintings since 1984. Today, his painting are characterized by strong contrasting colors with an intense sense of expression. Famous for his theatre and street scenes, Dung's works yield a surprisingly modernistic flavour whilst being deeply rooted in the Asian traditions. Tuồng is a theatre form strongly influenced by Chinese opera. It transitioned from entertainment for the royal courts to travelling troupes for commoners and peasants. It features well-known stock characters in elaborate costumes and make-up.